Welcome to our Baby Blog! In mid-November, we found out that we were pregnant. A few weeks later, we found out that we were pregnant with not one baby, but with TWO babies! A little scary and a LOT exciting. 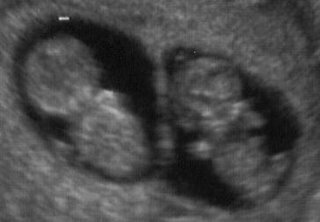 As of today, I am 13 weeks and 3 days pregnant (the ultrasound picture above was taken at 10 weeks, 2 days). Our babies are growing like crazy, which I can tell because they wear me out so much (and they aren't even here yet)! Also, my clothes seem to get a little tighter each day. I finally had to give in and start wearing some maternity clothes, and boy are they much more comfortable! Whoever invented elastic was a genius!! Of course, it is too soon to know whether we have boys, girls, or one of each, but we do know that we will love them no matter what they are (although we hope for one of each). Hopefully we will get to find out the sexes in a little over a month. So far, they seem to be on track growth-wise and their little hearts beat like crazy! It is so cool to hear. Well, I think that pretty much sums up the pregnancy so far. Please feel free to leave comments. Also, if you have an idea of something neat to include in the blog, you can let us know that too. Thank you for checking out our blog and please check back for future posts. I love it !!!!! They are so pretty already! I can't wait to hug and kiss them! Christy, I am so happy for you. I look forward to hearing updates from your mom at school. Let me be the first one to say that I think that you have a boy and a girl. I will continue to pray for you and your babies. Christy, this is old "Mr. A" Your mom just emailed me with the news. First, congratulations to both of you and may the twins be healthy, happy, and as good a student as you were (but not quite as spoiled) lol. I sincerely wish for y'all the very best of everything. they get here I am ready for some little babies in the family.